Archimedes of Syracuse (c. 287 BC – c. 212 BC) was a Greekmathematician, physicist, engineer, inventor, and astronomer. King Hieron II of Syracuse in Sicily was worried that a jeweller had stolen some of the gold from a crown. The king needed a way to figure out the exact volume of the crown to figure out if some the gold had been removed. He put Archimedes on the case. At first Archimedes was stuck. How could you measure the volume of an irregular shape like a crown? Then one day as he was stepping into an almost full bathtub, he realized something. The amount of water his leg displaced was equivalent to the volume of that leg. He suddenly understand that the volume of irregular objects could be measured with precision! “Eureka” he shouted as he ran naked through the streets of Syracuse. 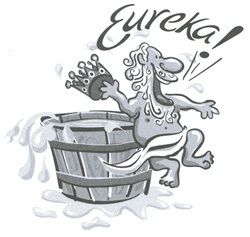 Ever since that day, Eureka has been associated with an out of the blue discovery – a stroke of genius. Creativity is just connecting things. When you ask creative people how they did something, they feel a little guilty because they didn’t really do it, they just saw something. It seemed obvious to them after a while. That’s because they were able to connect experiences they’ve had and synthesize new things. And the reason they were able to do that was that they’ve had more experiences or they have thought more about their experiences than other people. (Wired). So as you enjoy this weekend, think to yourself: what connections can I make? And let the creativity flow!